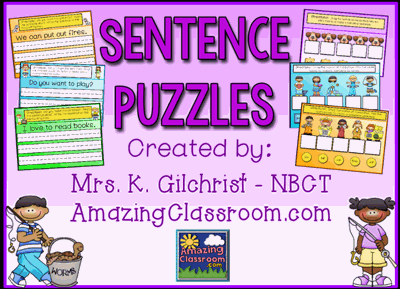 Your little learners will have fun putting sentences together with this Sentence Puzzle Flipchart. The slides contain container activities where students have to put five words in order to make a sentence. Writing pages are included so students can write the sentences they unscrambled. There are several voting pages. Students read the words aloud and then decide if the sentence is written correctly or incorrectly, using Activote devices. Enjoy!